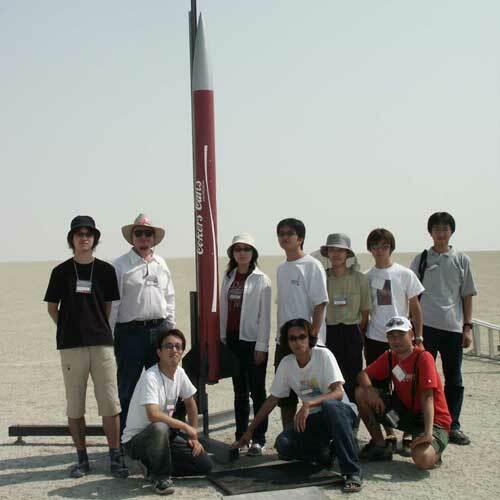 Some members of AERO-PAC, organized by Tom Rouse, worked with Professor Bob Twiggs of Stanford to build rockets to launch student satellites from amateur rockets at the Black Rock Desert. For more information about the program, see the ARLISS web site. The first ARLISS launch was held on September 11, 1999 after much planning. Two teams from Japan, a team from Arizona and a team from Redwood City, CA each built three "can sats" and the ARLISS team provided four rockets to launch them. The program grew each year since then, with more universities participating and more flights. Space Mouse 3 is returning to Black Rock! Two years ago, it made an attempt at the staged M record but the failure of the second stage to ignite brought that to an abrupt conclusion. This time out it is once again using the same motor configuration. In the all minimum diameter stages, it will be flying off the pad on a 75mm M1315. The second stage is 54mm K700, and the third is a 38mm J570. The expected altitude should be somewhere between 50 and 60 K.
In the top stage will be an Adept 60K altimeter. Last time we had a GPS in the nose cone. Not sure about that this year. I'm still working on that aspect. All these years, there's been this 100k waiver at AeroPAC's launches. Well the Club finally decided to do something about it! All In is designed to be the next generation of ARLISS CanSat carrier. Two Video cameras with live downlink and onboard capture. Sustainer: carbon fiber braid (Aerosleeve) over 4” dia Hawk Mountain filament-wound fiberglass tubing. Booster: carbon fiber braid (Aerosleeve) over 4.5” dia Performance Rocketry G10 fiberglass tubing. I want to thank all those that have donated parts, without you folks this project would not have been possible, Jim Green, John Coker, Tom Rouse, Richard Hagen, Mike Brest, Steve Wigfield and Paul Sutchek! The biggest little adventure continues! Mercury Joe returns full strength after a tragic ending last year. Already flown this season on a M1315 at HardRock 2005, the rebuilt vehicle is ready to send our intrepid 11" tall astronauts into near space. Currently there are two planned L1300 flights with hopes for a 3rd flight on EX day. Jamie's L1 certification rocket - and his most flown HP bird.